Huntingdon-based Supreme Concrete was founded in 1979 producing precision-manufactured concrete products and supported by exceptional customer service. 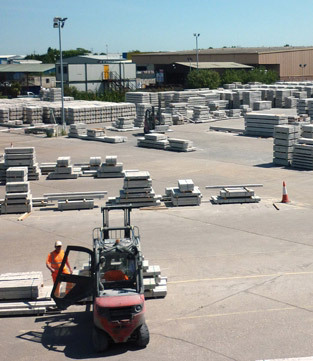 This led to rapid growth, so that today Supreme Concrete offers a comprehensive range of pre-cast building components, fencing products and lintels. The company was looking for a contractor which they could trust and work well alongside, who would do the job on time and allow operations to continue without disruption. That contractor was the Heming Group. After sustained use and heavy load bearing traffic, the yard at Supreme Concrete needed considerable repair and attention. There were three main stages to the project. Firstly, the existing failed concrete surfacing was broken-up and removed. Next came a new stone sub-base and finally the area was laid with reinforced concrete slabs. The yard was completed on time and with disruption kept to a minimum. throughout the job. The team was a pleasure to deal with and a credit to the company,” said Andy Beasley, Safety Champion, Supreme Concrete.